Good bathroom design should elevate a utilitarian space into a place for rejuvenation and self-care. 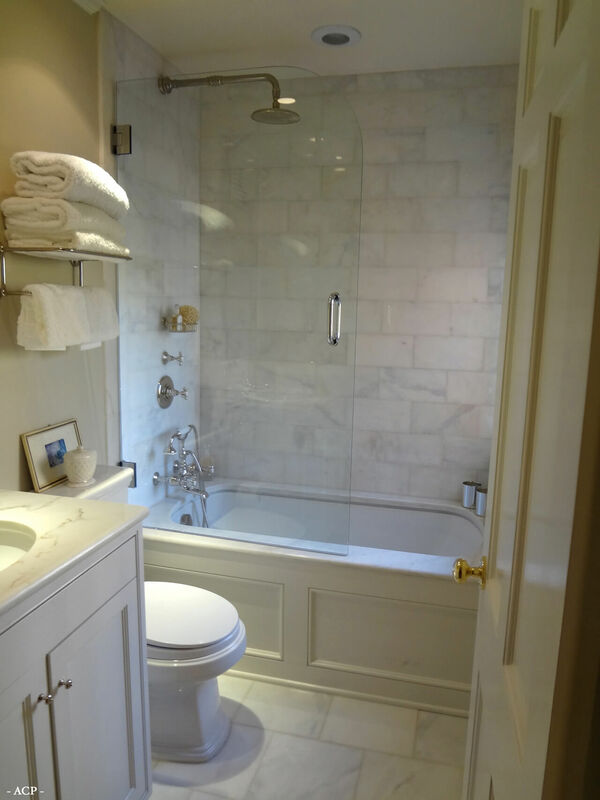 Outdated, cramped or oddly outfitted bathrooms can disrupt the daily personal hygiene activities that lead to wellness. If you find yourself getting in and out of your small bathroom as quickly as possible each morning, it could be time for a redesign. 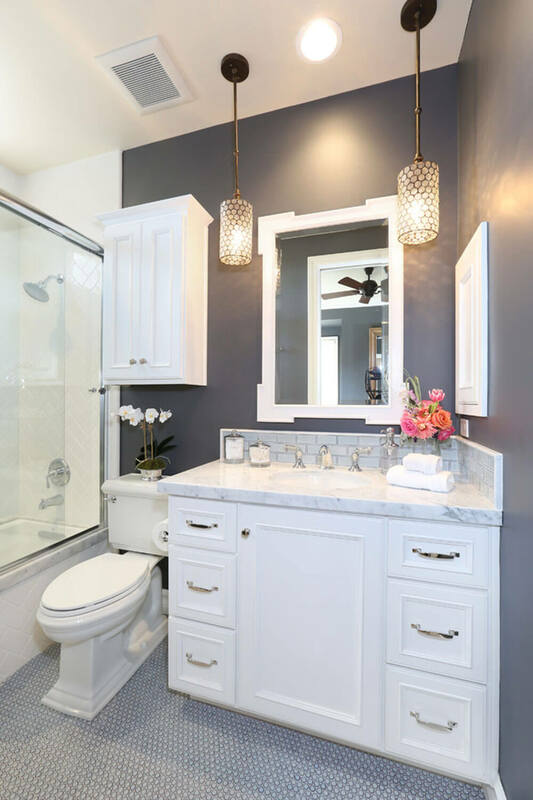 As you begin your search for small bathroom design ideas, it might seem that decorators only cater to those with the expansive bathrooms normally featured in decor magazines and home renovation television shows. Don’t be disheartened! If your bathroom is barely big enough to accommodate one petite person, rest assured that you’re not alone. 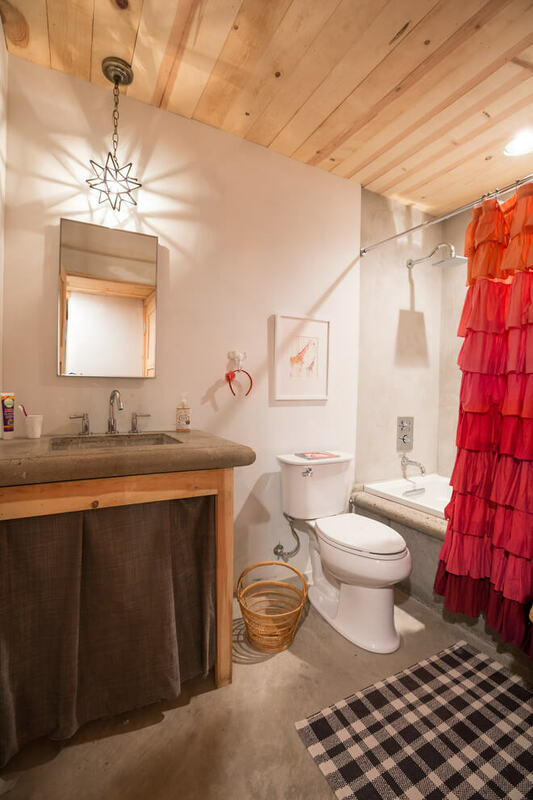 Design divas all over the internet have tackled the problem of cramped bathroom quarters. We’ve selected a variety of the best small bathroom decorations below. 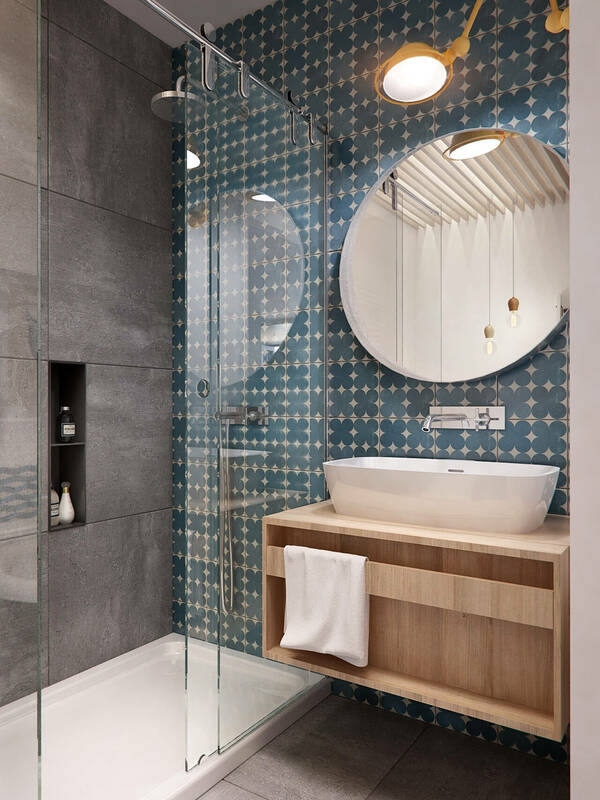 Even if you only have a modest space in which to work, you can find ways to open up space and create an aesthetically pleasing respite by applying some inspiration from this collection small bathroom designs. You’ll find modern, retro and classic looks in an array of color schemes and mood themes. 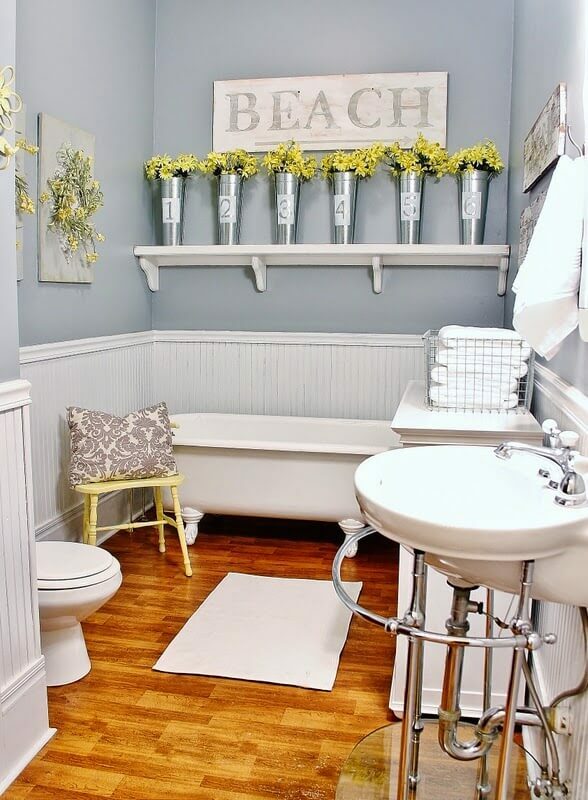 With a little help from these lovely small bathroom décor ideas, even a tiny washroom can become your sanctuary. This is a beautiful, modern design with touches of elegance. It is simple, with a dark grey color scheme and clean lines, but the marble countertops add charm. The wood trim around the white cabinets also adds texture and depth to the area. The bathroom doesn’t feel small, especially with all of the innovatively designed storage options in and around the room. Step into the luxury of a 4-star hotel with this bathroom design. Marble tiling in the tub brings culture into the small space. The marble tile floor follows the pattern of the tub and provides a consistency to the room in a striking way. The deep soaking tub features a rain shower and a hand-held faucet feature, which adds a touch of luxury to your daily routine.The open towel storage solution will let you showcase your fluffiest towels, and remind you of your last stay in a luxury hotel. This solution is perfect for any person who loves retro-charm. A clawfoot tub provides old-school appeal and is the perfect place to soak or read. The exposed pipes of the pedestal sink complete the old-fashioned look. 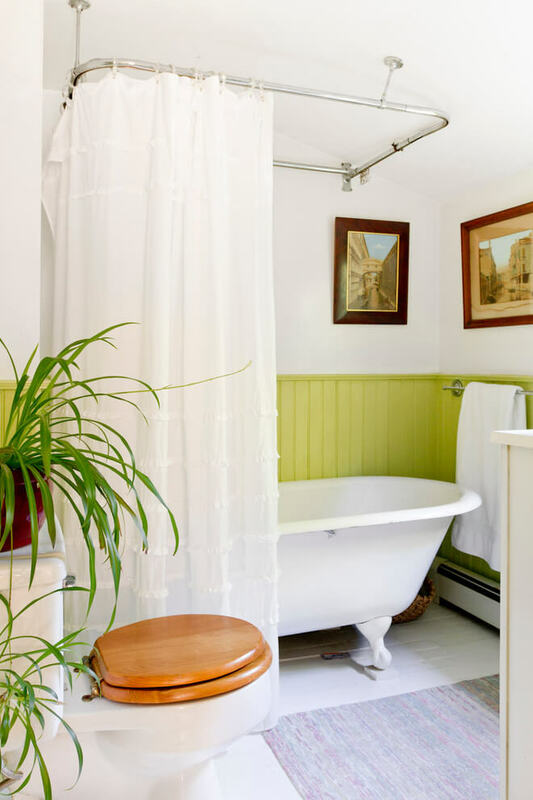 This bathroom may not look out into a garden, but with plenty of light colors, and elements of nature, it can transport you to your own secret garden. This modern bathroom is perfect for an in-city loft or contemporary home. 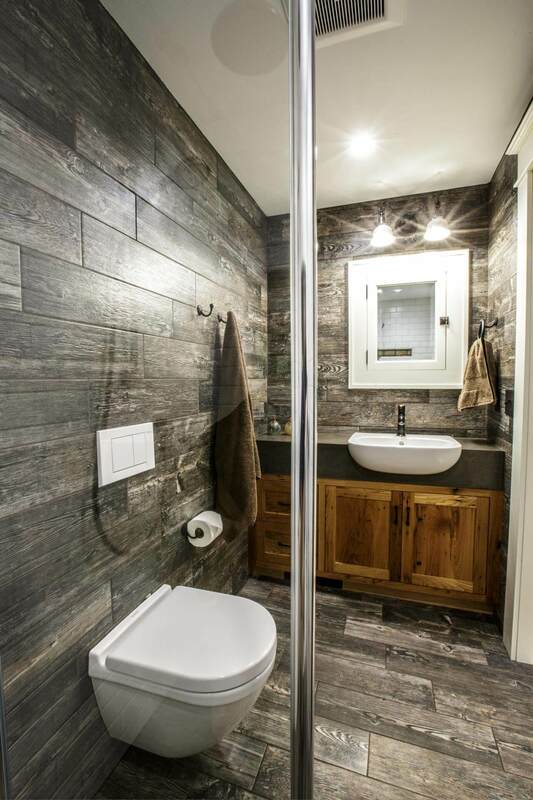 The concrete flooring and exposed wooden ceiling provide amazing textures to this simplistic bathroom. These simple elements are mimicked in the designs of the tub and sink, making the space look larger with a cohesive design. Linens on the sink, rug, and shower curtain bring a touch of softness to this industrial design. This Victorian bathroom design brings the appeal of times gone by. A classic clawfoot tub and simple pedestal sink are contrasted by extravagant brass light fixtures. The sunny yellow and white color schemes are mimicked in the fixtures and linens of the room. 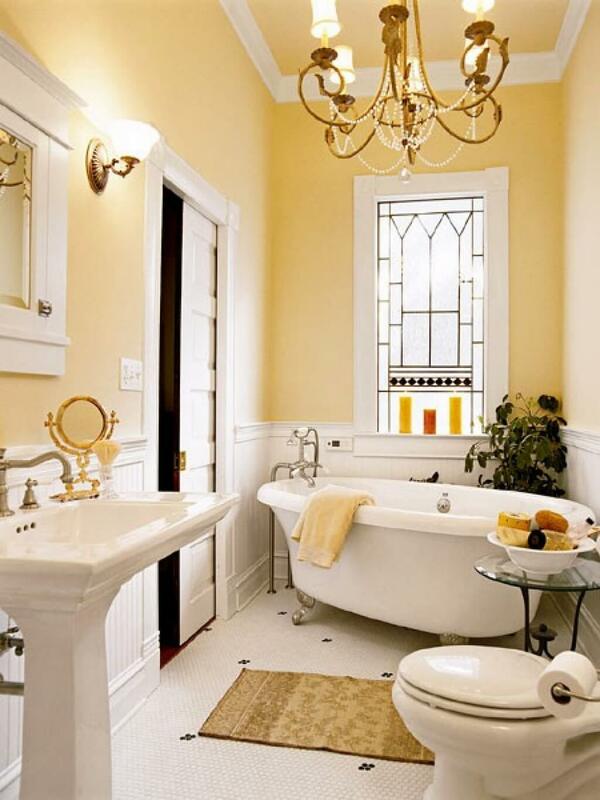 A beautiful stained glass framed window brings in light while completing the charm of this old-fashioned bathroom. 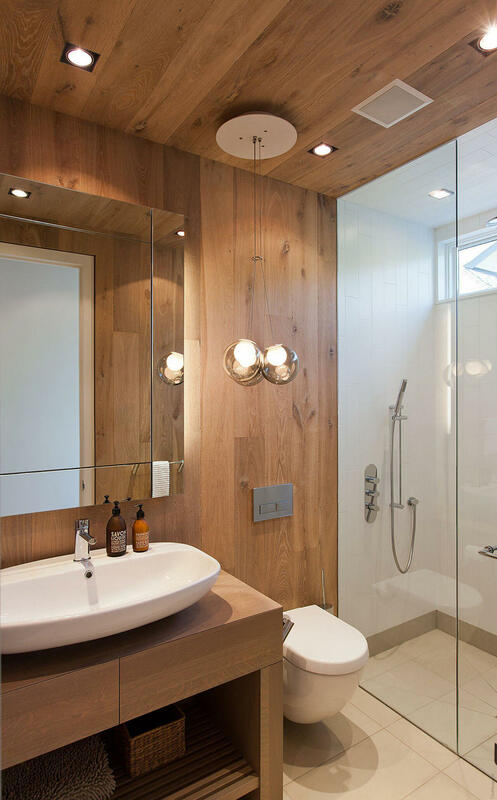 Wood textures are on display in this modern bathroom. 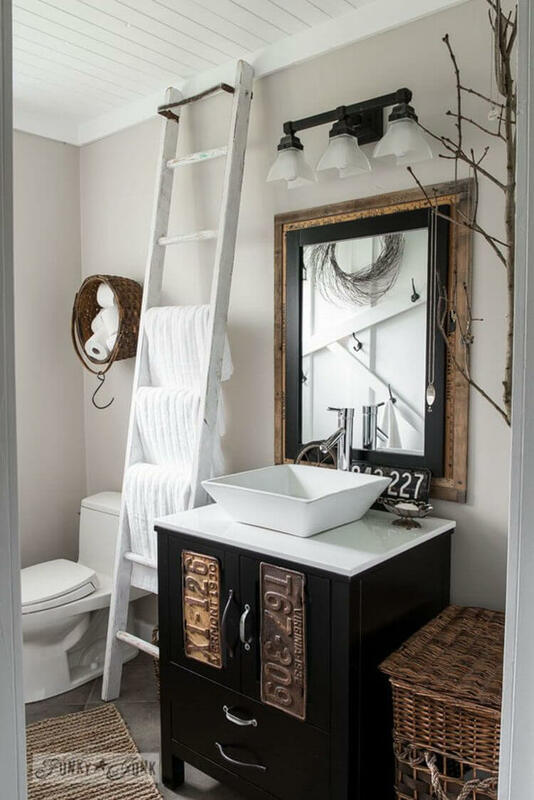 A ladder leaned against the wall above the toilet adds a practical storage solution, while bringing rustic, farmhouse elements into the room. 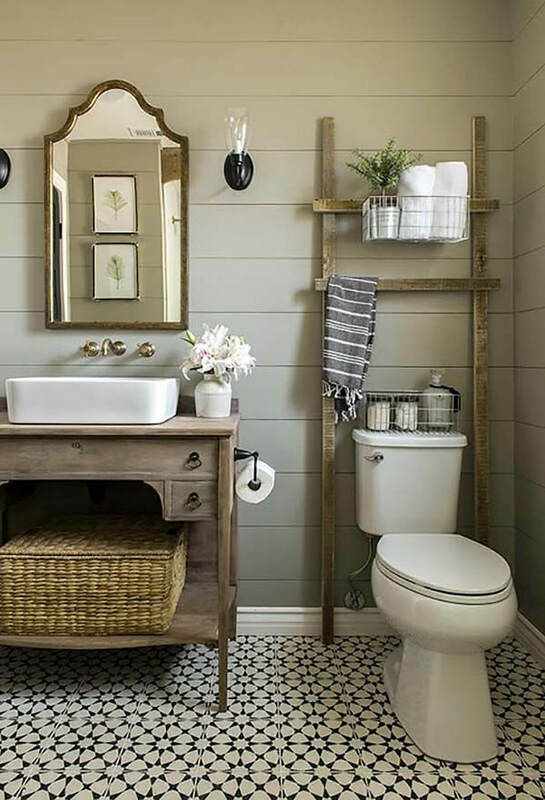 These elements are imitated in the raised porcelain basin of the farmhouse sink and the wicker baskets that serve as storage solutions under the vanity. The beach is brought indoors in this ocean-inspired design. Nautical inspired wainscoting lines the ceiling and walls, in an ocean themed blue and white color scheme. The White tile flooring with grainy accents is reminiscent of the sand. Copper fixtures pop against the lighter colors and add richness to the room. 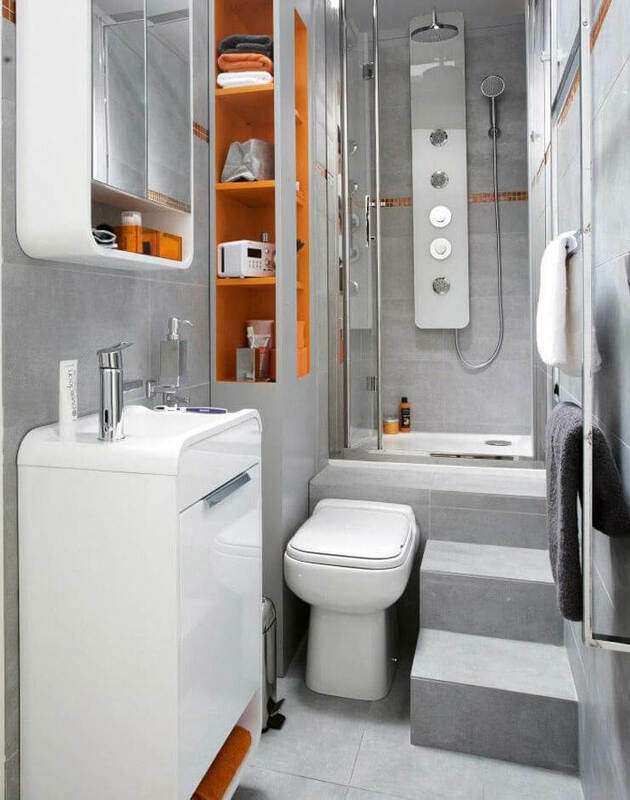 This tiny bathroom packs a lot of style in a small space. The white colors make the room seems brighter and bigger. Crown molding is placed below the ceiling line, which draws attention upwards, and adds height to the room. Rustic wooden shelves add open storage solutions, and a simple, geometric pattern adds texture without cluttering the room. The over-sized mirror plays a starring role in this bathroom design. With its expansive size, it reflects the bright colors of the room and gives a sense of spaciousness. The plain lines leave the space feeling simple and uncluttered. The sink brings an extra level of interest and acts as an accent piece to the space. Simple metal shelving acts as open storage, providing a simple, but a visually pleasing solution. 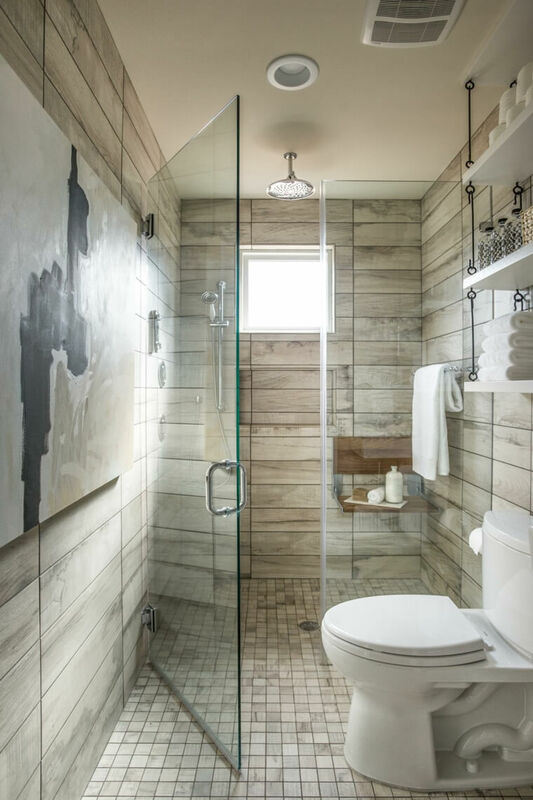 Weathered-wood paneling lines the walls and floors of this bathroom, adding exciting details to the space. Contrasted by the dark walls, the white features of this bathroom pop. The white, plain ceiling ensures that the space does not feel too dark or overwhelmed by the wood. 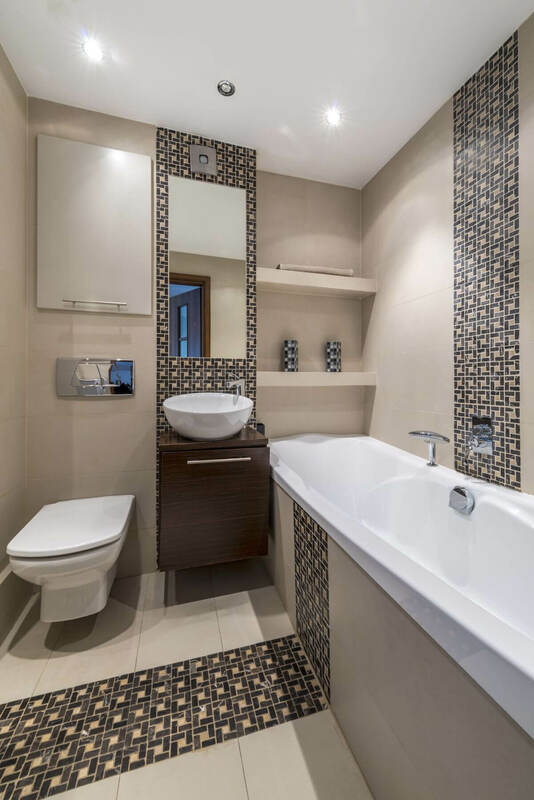 The dramatic effects of this bathroom make it the perfect solution for anyone who wants their small space to make a big impression. You can feel like a regular mermaid in this bathroom. 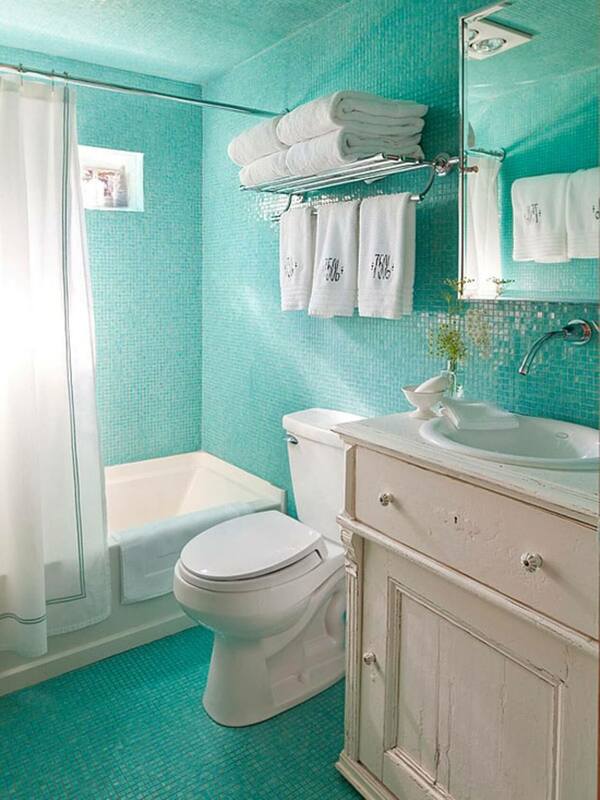 Glittering blue tiles encompass the room, creating an ocean of blue. The mosaic is only minimally interrupted by shining metal and subdued white colors. The antique-inspired vanity is the ideal addition to the mermaid’s hideaway, and the gently curved faucet is suggestive of a mermaid’s tail. This outdoor-inspired bathroom feels like a natural hideaway. The rock-lined shower features a rain-head faucet, making you feel like you are washing in a waterfall. Wood floors extend the natural feel. The sink and toilet are kept simple so they don’t interrupt the motif. Potted plants, pillar candles, and lots of natural light perfect the organic character of the space. If your bathroom is becoming a bit out-of-date, this bathroom solution is ideal. 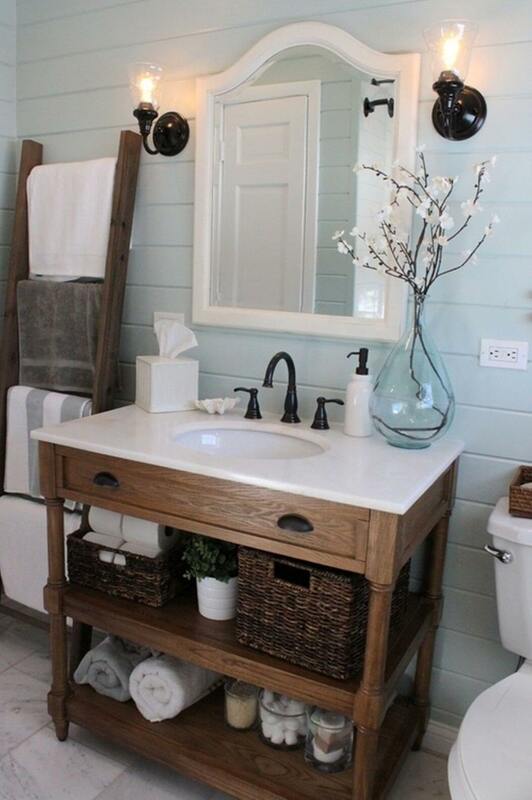 A fresh coat of paint and some hardware upgrades give this basic vanity a modern feel. Painting old lightening fixtures in uniform black updates their look without having to replace them completely. Adding industrially inspired shelves with metal whicker baskets brings the look together and draws your bathroom into this century. 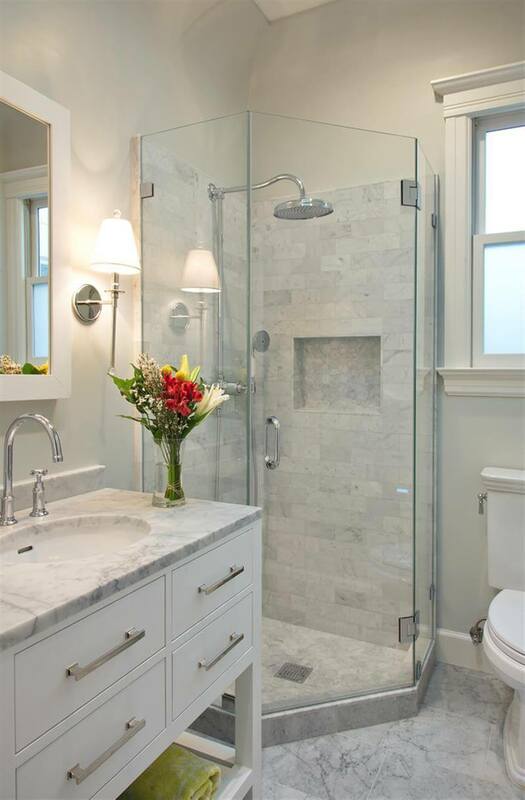 Simple white marble and gentle light make this bathroom the perfect, calming area for your home. The spa-like shower provides you a choice of a rain or hand-held shower head. The uniform look inspires you to quiet your mind, with no signs of clutter or stress in sight. Natural, relaxing light makes the space feel larger. Cute and pretty accents are the main draw of this classy design. A lovely clear display case makes storage into a statement. The vase-like lamp adds a surprising, and unique lightening element to the room. Potted lavender and a richly textured shower curtain complete this well-appointed space. 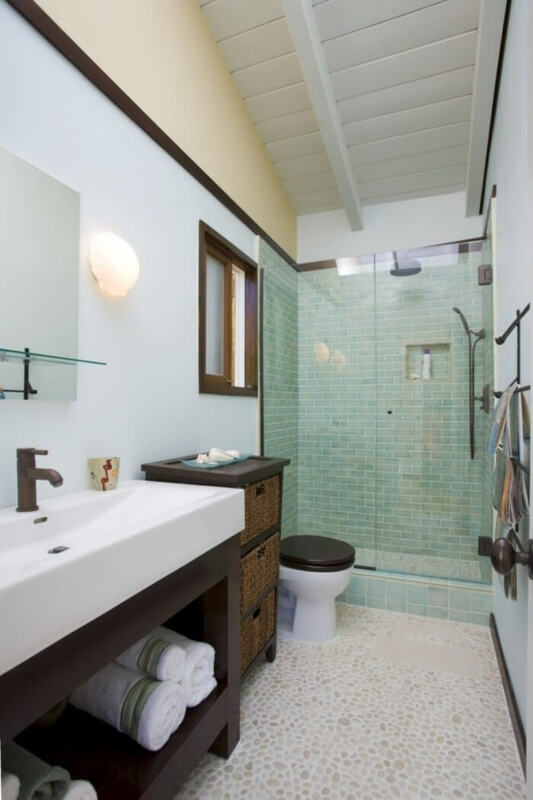 This adorable bathroom is perfect for people who love modernist designs but hate boring colors. Pops of bright blue shine through the tiled wall. A unique yellow desk lamp serves as a quirky vanity light. 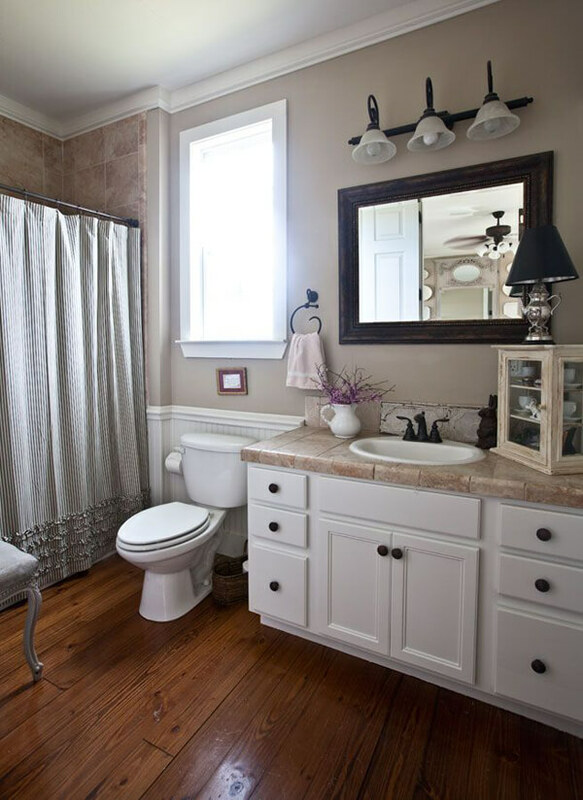 A round mirror adds to the fun design and a free floating pedestal sink gives the illusion of extra space. 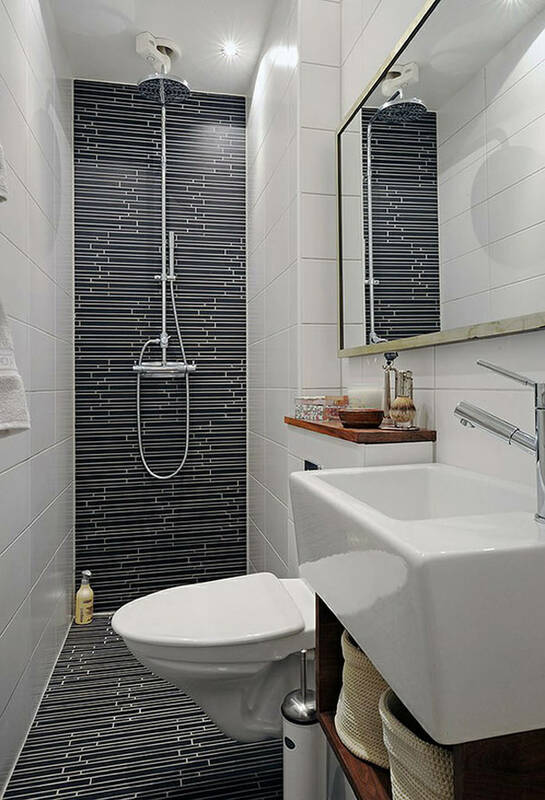 This design uses unconventional features to create a cohesive, modern, and fun bathroom. Who says wallpaper is dead? 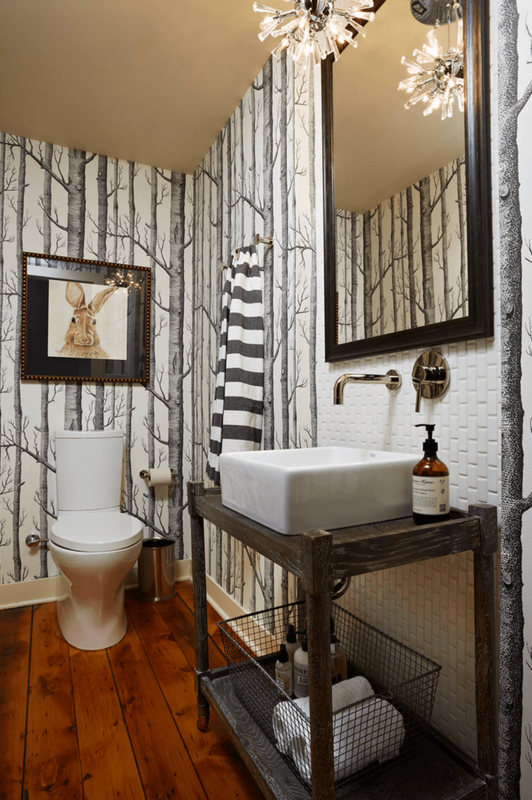 Far from looking dates, this woodlands themed wallpaper adds lines to this bathroom that draws attention to its height, and makes the room seem larger. The simple, geometric sink and clean, white backsplash prevent the wallpaper from making the room look cluttered. The nature theme is continued in the wood flooring and the artwork accents. 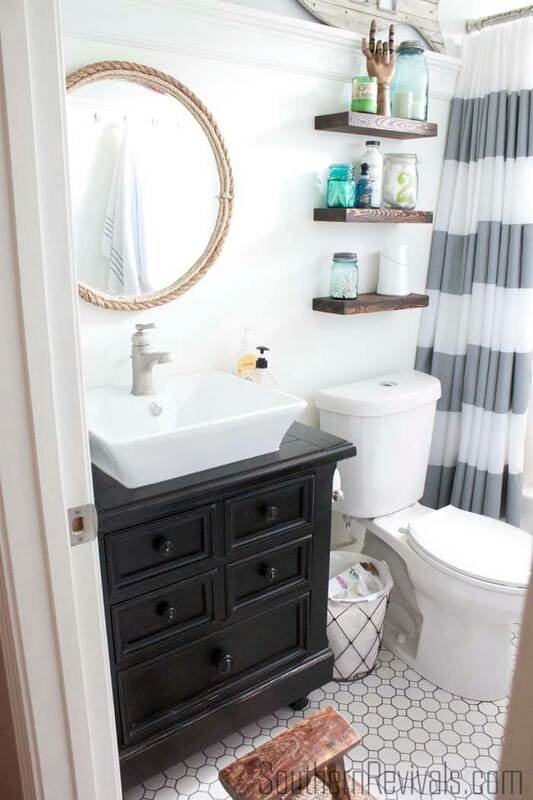 This simplistic bathroom uses a monochromatic color scheme to blend shelving into the walls. The shelves allow fully displays of collections of shells in this design, adding to the nautical feeling of the room. This design, however, can be modified to showcase whatever treasures you love. The barebones clawfoot tub, copper pipes, and chair and basin add rustic charm to the space without detracting attention from the highlight shelves. If stark colors are more your speed, this bathroom is for you. 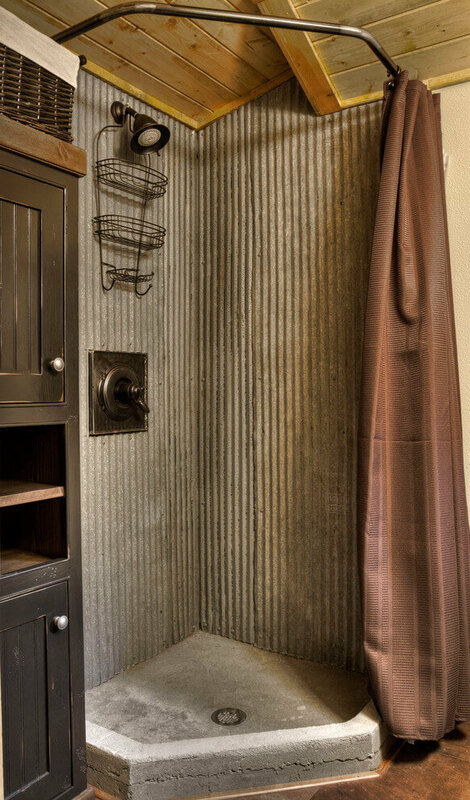 A concrete based shower with metal siding acts as a strong focus of this design. The dark textiles and colors give the space a powerful feel. The distressed wood cabinets also add drama to the area. Comfortable brown linens contrast bright blue walls in this rich scheme. 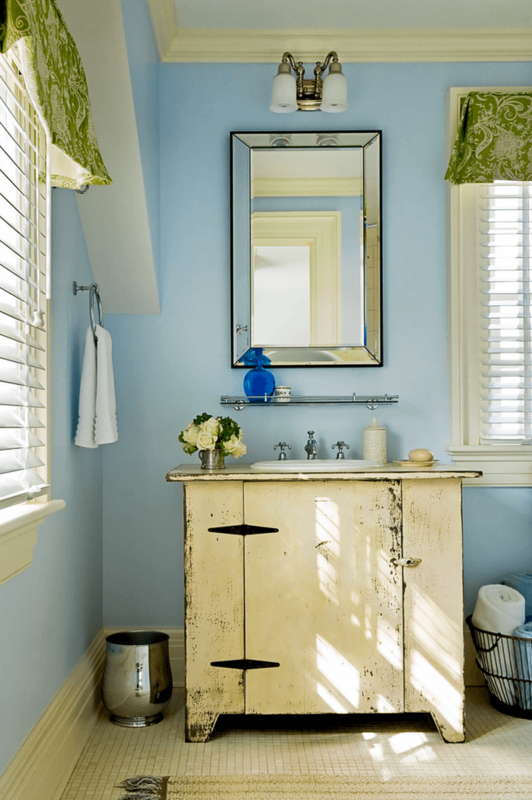 The light blue walls provide light, while the brown wood vanity and ladder add darker elements. Rich, fluffy towels, and wicker baskets provide warmth. A clear blue vase with woody blooms ties the two looks together. This gorgeous design brings the peace and tranquility of the spa into your home bathroom. Cedar wrapped ceilings and walls bring warmth and the healing properties of nature. The simplistic, neat lines provide unity to the room and inspire calming thoughts. The high window and white tiles in the shower afford lots of light to the room and add another touch of nature. This minimalist design is anything but boring. The simple, bright colored room is interrupted by a mosaic pattern of colors. The pattern extends from the bath wall to the vanity, to the floor, and even to the candle holders. The repeated pattern adds a level of interest to the standard design, elevating the standard scheme to a truly unique space. 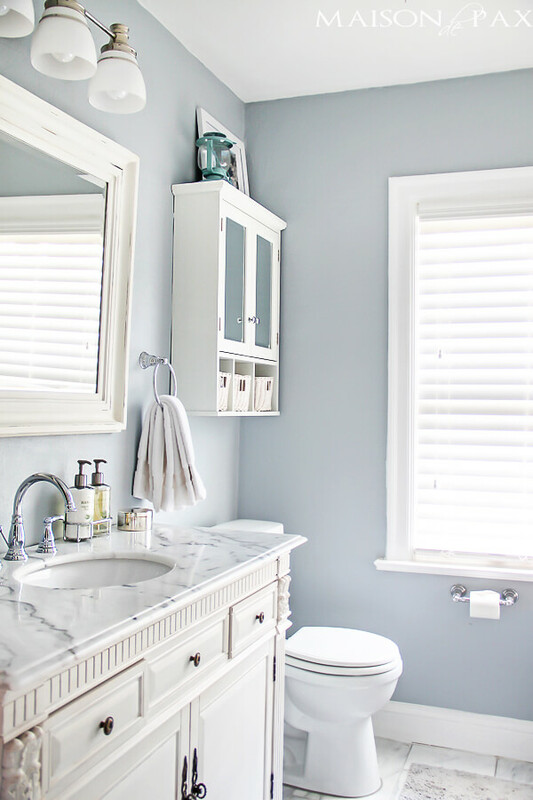 This bathroom provides a gorgeous upgrade to a standard home feature: the medicine cabinet. Rather than hiding your things behind a bulky, ugly mirror, this bathroom adds glass and paneling to the medicine cabinet. Clear shelves, a glass window, and white paneling turn something homeowners usually hide into a featured piece. This bathroom is the perfect way to wake up in the morning. An energizing, lime green wainscoting gets you up and going. The green color scheme is mimicked in the potted plants and the natural element is reflected in the wooden toilet seat cover. The green glow is kept from overwhelming the space through simple, white colors. Elegant, but minimalistic, this design takes its color scheme from the marble countertops. Silver walls and white trim mimic the marble countertops through the room. 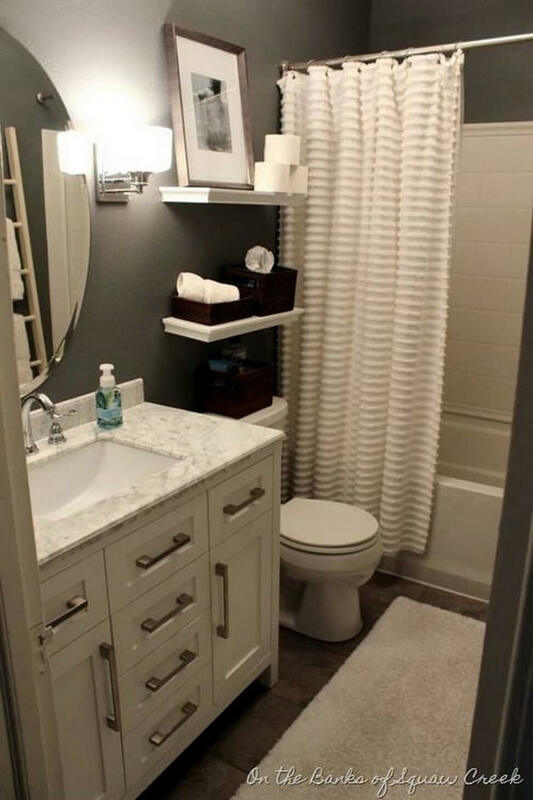 white storage bins and a rich, carved vanity bring elegance to the forefront without sacrificing the streamlined design. City apartments can have beautiful bathrooms too. The charcoal greys and black bins in this design give the room an urban feel. The white counters and subway tiled bath give light to the space, and an oval mirror lends length and makes the space seem larger. 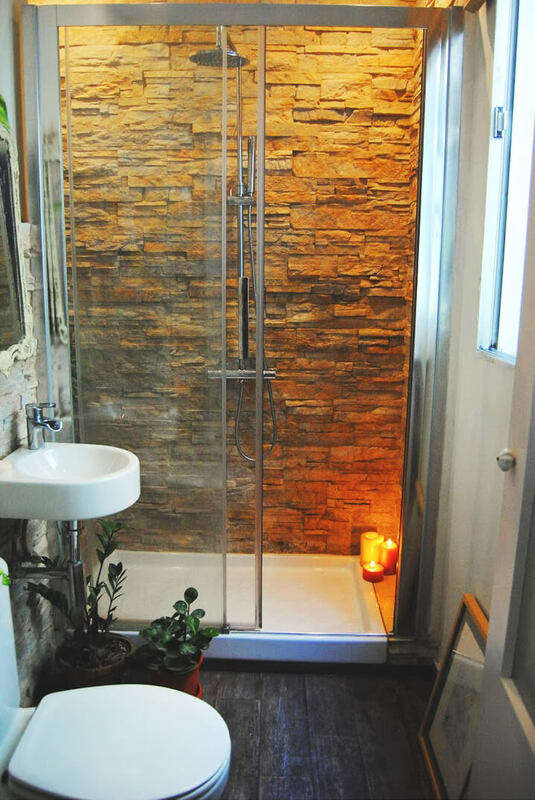 This beautiful bathroom is inspired by nature. Pebble flooring is reminiscent of gently flowing rivers, a motif which is mimicked in the gorgeous, blue, mosaic tiles lining the shower. Dark brown accents provide a wooded feel to the room. While the white sloped ceiling draws the eye upward and bathes the room in light. 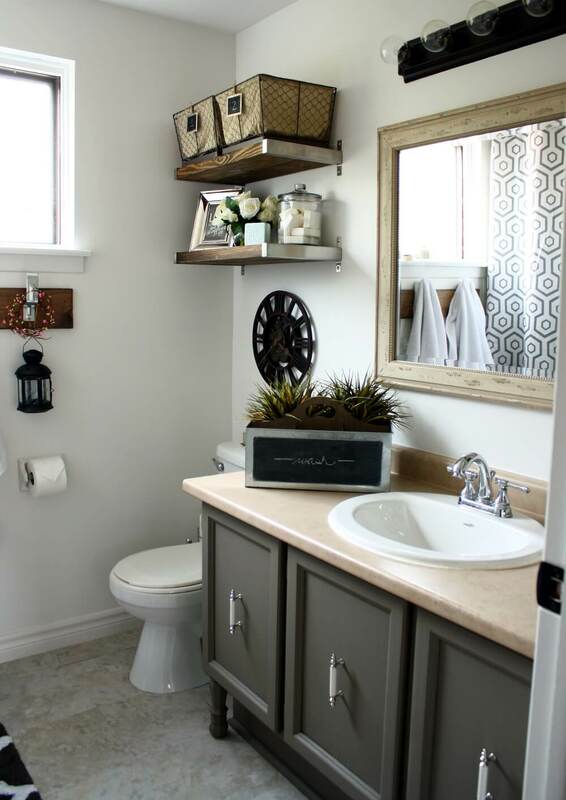 It doesn’t take a fortune to revamp a space, even garage sales can be a source of inspiration and decor for your bathroom. 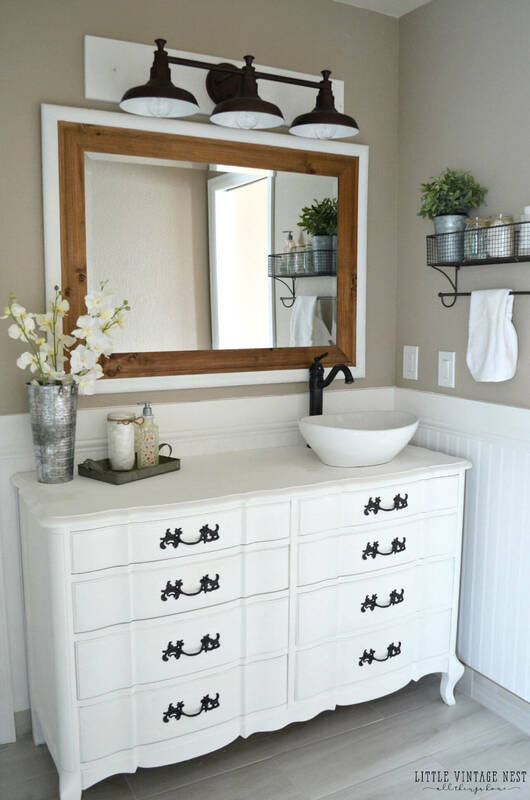 Showcased in this design, garage sale finds can be repurposed and upcycled to provide charm in your bathroom. Old license plate are reimagined as decor, lending a rustic quality to the design. The is complemented by a garden ladder which has been remodeled for towel storage, and a hand-woven wicker basket that is given new life as a bathroom shelf. This tiny space turns its back on convention and gains space in the process. By forgoing a curtain, the room doesn’t feel as divided, and the space seems larger. The uniform tile extending from the floor to the back wall of the shower also provides unity and ties the space together. This modern bathroom is breezy and light. Large, horizontal tiling draws attention to the width of the space and makes it seem more expansive. Likewise, the clean, geometric lines leave the space feeling simple, modern, and inviting. 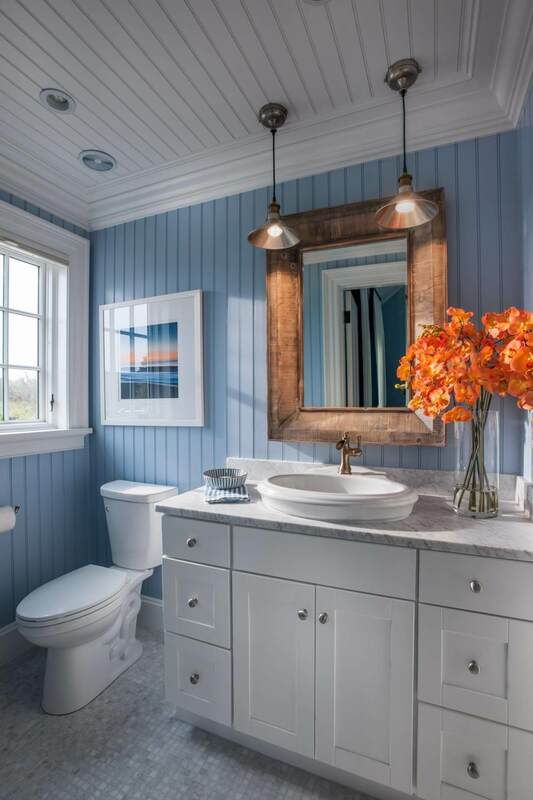 This beautiful blue bathroom is flooded with natural light. With gorgeous, white Venetian blinds, light can enter the room without sacrificing privacy. A pop of green on crisp, bright valances brings an element of contrast to the blue. 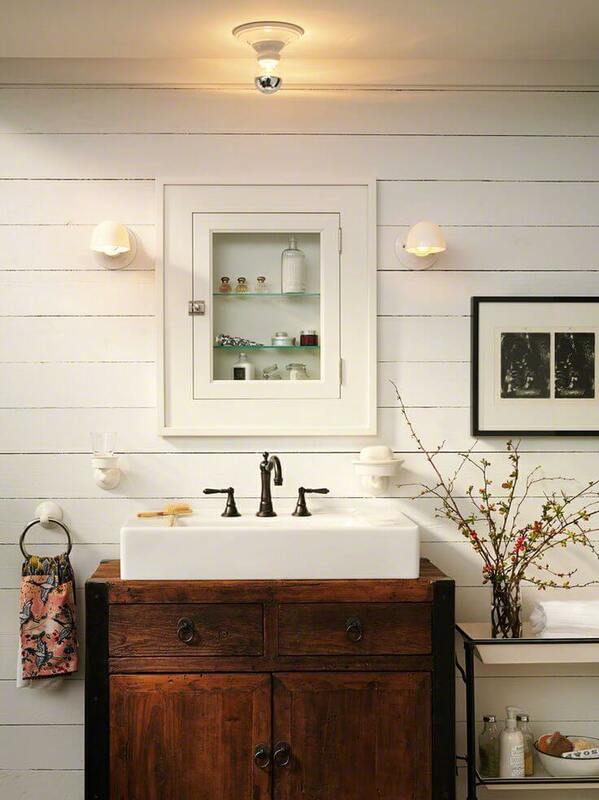 A weathered white vanity affords rustic charm to the room. One of the first things that catch the eye in this design is the unique toilet placement. This design feature utilizes the natural depth of the tub, and makes sure not a square foot of space is wasted. However, there is much more to see in this design than just the commode. Beautiful pops of orange come through clean white fixtures and gray walls. Chrome fixtures grant a mid-century modern feel to this quirky bathroom.